It looks like being a mixed bag of weather for the Bank Holiday weekend with cloud, rain and sunshine - but it will be warmer. The Met Office say that following the chilly, wintry weather this week, it will become warmer for the weekend with most places seeing sunny spells, but with rain for some too. Over the next few days temperatures will recover closer to what we’d expect for late April as the winds change from a northerly to a southerly direction, with daytime maximums in the low to mid teens Celsius. We’ll also see a rise in night time temperatures with most places becoming frost-free. Over the weekend, many places will be dry and fine with bright or sunny spells and just a small risk of a shower. A strengthening southerly wind will develop across the west of the UK on Saturday ahead of a band of rain which will arrive later in the afternoon on Sunday. Moving into Bank Holiday Monday, the band of rain will continue to move north-eastwards across the UK, but becoming lighter and patchier and clearing during the day with the wind also easing away from the coast. Some drier weather will follow behind the front with sunny spells. 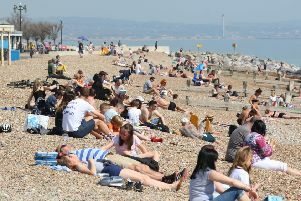 There was a suggestion that the temperature would rise dramatically next week, but the Met Office is being more conservative with its forecast of around 16degC by Wednesday (May 3).